Hiro Mashima, best known for his manga Fairy Tail, is beloved by many fans and has a large following in the West. 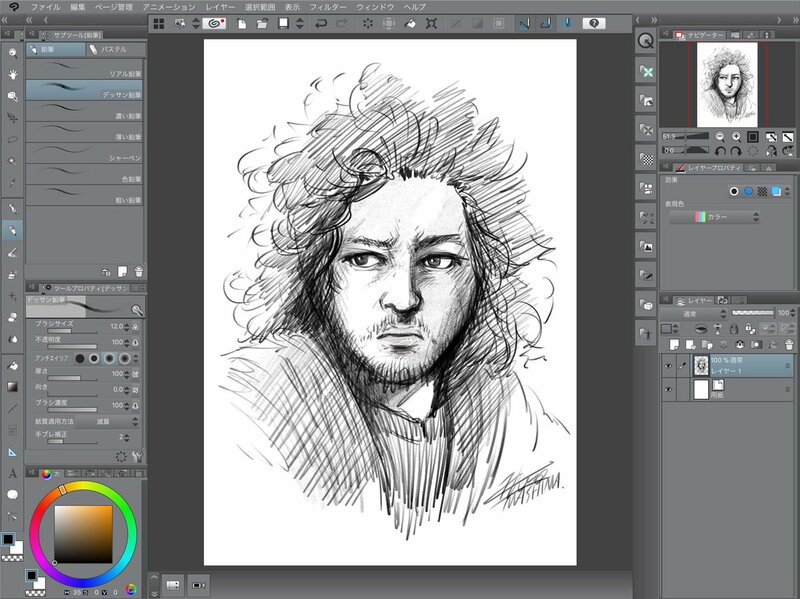 He’s active on Twitter, cranks out extra character drawings every few days, occasionally makes his own fan art, and has written a lot of material. While most other mangaka have only one or two major series, Edens Zero will be Mashima’s third major one and fifth series overall. After Fairy Tail wrapped up quickly and left off in a weird place, many fans were wondering what its creator was going to do next. It’s been three months since Edens Zero began its publication, and with enough chapters to complete the first volume, I thought it was a perfect time to discuss and review Mashima’s new story. 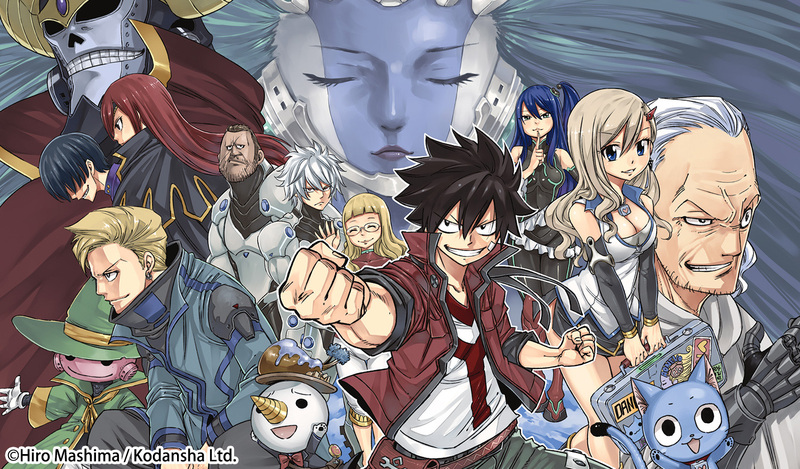 At a bird’s-eye view, Edens Zero is a fantasy that takes place in space. It follows the story of Shiki, Rebecca, Happy, and Doctor Steiner as they journey from planet to planet searching for a being known as “Mother.” Chapter 1 begins with Shiki as a child and his “grandfather,” the king of the robotic planet Granbell, staring at the night sky. The king says Shiki must leave someday and find friends he can trust. The story then jumps to present day, when Rebecca and Happy land on Granbell, looking to shoot a video for their “B-Cube” channel, and meet Shiki for the first time. Eventually Shiki leaves with them to begin his journey, and the chapter ends with Mother saying to herself that Shiki will change the universe. 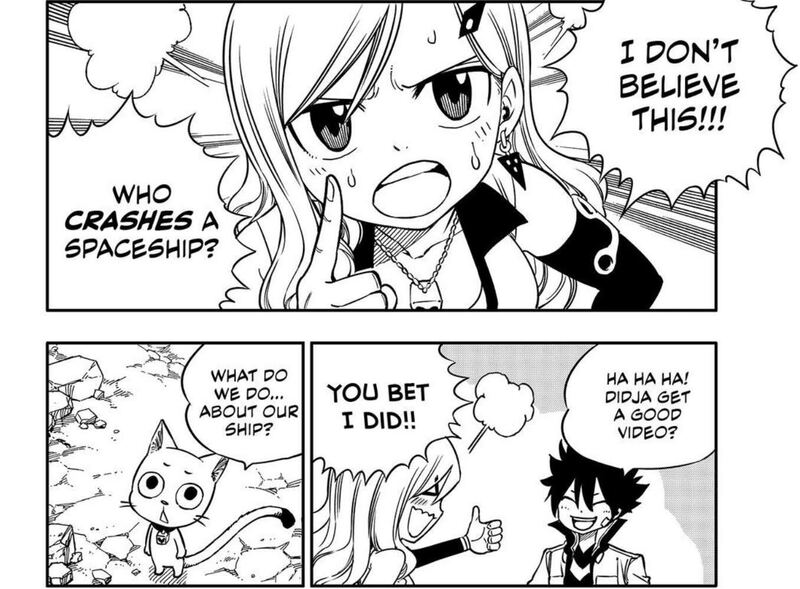 Although Edens Zero is a fantasy, it breaks from Mashima’s other stories by being the only one that takes place in space. This gives a lot of freedom for the artist to create whatever worlds he wants, whenever he wants. The possibilities are limitless, and even in the first 10 chapters we’ve gotten a nice glimpse of how Mashima is choosing to flex his creative muscles. We’ve seen three different planets, a giant mechanical dragon floating through space, time travel, androids, futuristic videos, space pirates, and gangsters. Each setting provides an interesting backdrop for getting to know our new leads. Shiki Granbell definitely falls into the shōnen male protagonist stereotype and closely follows the beats laid down by Dragon Ball. I don’t have a problem with this. Shiki is still his own character, and his origins serve the plot of Edens Zero. When he meets up with Rebecca, he’s never left his home planet before, but more than that, he’s never met another human being. As a result, everything he sees elicits innocent curiosity and bright enthusiasm. As readers, Shiki represents our point of view, and his excitement easily translates. He is adorable, and I find myself gleefully reaching for my iPad to read the latest chapter when it’s posted on Crunchyroll. His power-up is also interesting, and I haven’t seen anything quite like it across the other shōnen manga I’ve read. Shiki has the ability to manipulate gravity for himself and anything he touches through an implant in his arm called Ether Gear. This has already created some innovative fight scenes, with Shiki “falling sideways” or hanging upside down from the ceiling. I’m looking forward to watching his power evolve and learning what other applications it will have as the story progresses. Just as Shiki has some typical shōnen attributes, Rebecca, who is a bit of a nerd and loves playing video games, also shares traits with other shōnen female leads. She’s got a bit of temper (see every other shōnen manga for examples), but I find she’s a lot more forgiving and willing to go with the flow. Take a look at these panels from chapter 3 to see an example of this. Stick any other shōnen female lead in this situation and they would’ve been raging for days, but Rebecca tends to see the positives. When Shiki proposes the crazy idea of finding Mother to make the ultimate video, Rebecca jumps up with enthusiasm. She doesn’t need to be talked into it. Chapter 2 is dedicated to her backstory and provides an emotional anchor for the story; she also shares the same fundamental principles as Shiki, and in this chapter we learn why she decides to take him with her despite barely knowing him. I also like that she can handle herself but doesn’t put on the “tough girl” act. Happy is primarily the same as he was in Fairy Tail, but there’s a key difference I won’t spoil here. And this brings us to one of the biggest complaints fans have about Edens Zero’s style and characters: “This is exactly the same as Fairy Tail!” and “Why is Happy in this manga? It’s not Fairy Tail!” To address these, I feel its important for fans of Fairy Tail to understand that reusing character designs is common in the manga industry. One only needs to look at Akira Toriyama’s Dr. Slump and early Dragon Ball to see examples of this. Even Yoshihiro Togashi, who is considered a genius mangaka writer, has reused designs and concepts, bringing over many elements from Yu Yu Hakusho to Hunter × Hunter. It’s normal, and honestly, I don’t see why Mashima gets flak for it. In his case, similar characters and designs are pervasive across all five of his published series, and some are intentionally on the nose. They’re meant to be a reward for following him as an author. Having read all of Mashima’s manga, I can say it’s a lot of fun to see old designs and characters come back. Discovering Happy was in Edens Zero made me smile, and I was excited to see Plue make his third appearance. And even though Mashima uses similar character designs, his male leads are all different. Haru is calm and carefully thinks through his decisions before acting. Natsu is brash, quick to settle differences with a fight and then laugh it off later. Shiki’s innocent curiosity is his driving force, and his eagerness to try new things both gets him into trouble and allows him to think outside the box. Unlike Natsu, Shiki is able to walk away from a fight. Some of the fandom has been calling Rebecca a “Lucy clone,” but I find this to be a gross overexaggeration of the similarities between the two. The traits they do share can be found in all shōnen female leads. But aside from that, Rebecca is different. Situations that would make Lucy irate, Rebecca takes in stride. As an example, in chapter 7, Shiki and Rebecca learn that their new friend, a robot, has been grossly mistreated and is being held captive. Shiki is understandably angry; his fists are shaking. He says to Rebecca, “Don’t try and stop me! We’re in the past, but I don’t care!” Calmly, Rebecca replies, “I wasn’t going to stop you. I want to make him pay, too.” That’s not something Lucy would say. It’s natural to compare Edens Zero to its predecessor, but I think this manga will be able to stand on its own just fine. It has been a treat to read thus far, and I don’t expect that to change. There’s already a lot of heart, adventure, interesting concepts, wonderful designs, and good panel layouts and placement all done in Mashima’s signature style. If you’ve been hesitant to try Edens Zero because it seems too similar to Fairy Tail, don’t be. This manga is a good time. You can read the simulpublished chapters of this series on Crunchryoll manga, ComiXology, and Kindle, and the first volume will be available for purchase in the US October 18, 2018.